Did you ever read those Choose Your Own Adventure books? They were big when I was growing up, and I read quite a few of them. For those unfamiliar, the basic premise is that the book's protagonist was "you," and you'd read to a certain point at which you'd have to make a choice about which action to take next, and then flip to the corresponding page, at which point you'd read a bit and then have to make another decision. I'm guessing that the intention was for readers to start at the beginning, make decisions until they reached a "The End" page (which usually meant "you" had died in some bizarre and unexpected way), and then pick up the book another time and start from the beginning to read a new story. This was way too haphazard an approach for a methodical child such as myself. I wanted to make sure that I had read every page of the book before I put it away. So every time I was asked to make a choice, I'd stick a finger in the decision place, turn to the page I wanted, and repeat until I hit an End, at which point I'd flip back to the most recent decision spot and go the other route. When I'd explored all branches of a particular path, I'd take that finger out of the book, flip back to the choice before that, and keep going. Recently it occurred to me (where all my best ideas come to me -- in church) that this is an excellent framework for approaching my life at the moment. I mentioned that I have way too many options right now for what to do with my life. Coming up with a list of rules has been helpful for getting my anxiety under control, but the Choose Your Own Adventure metaphor (at least the way I read the books) is a valuable way to think about Rule #5: "Even if you don't know where you want to end up, start somewhere. Pick something." 1. You can really only do one thing at a time. It's not possible to read all paths at once; you have to pick which one you're going to read next and leave the other option or two for a later time. I have a problem, when I have many things on my plate, of feeling the pressure of the other things I "should" be doing while working on one thing. I have to remind myself that I cannot write a blog post, edit a book, complete a job application, and unload the dishwasher all at the same time, so as long as I'm doing one of those things, I am being as productive as I can be, and the other things just need to wait. 2. Follow a path through to the end. It would be very confusing, at every decision branch in the book, to flip forward and read both options' next pages, then read each of those pages' options (four or five), and so on. Better to make a series of decisions, follow them through to the end, and then if it doesn't work out, come back and try something else. At the moment I've dedicated myself to editing my great-grandfather's war memoir and trying to get it published, and I've felt a lot better about things since putting everything else on the back burner and throwing myself into this project. People ask me if I've applied to any jobs lately, and I say, "Can't -- editing." Certainly, if something interesting shows up in my job post RSS feeds, I'll star it for later. But dedicating myself to this path right now means doing everything I can to make it a success -- getting other primary source documents from the library, finding friends to read the finished manuscript, asking my published author friends to help connect me with an agent. Better to do one thing wholeheartedly than seven things minimally. 3. A dead end is not the end. When you "die" in a Choose Your Own Adventure book, which happens often, nothing says you have to put the book down and walk away. You've explored a path to its end, and now you can take your finger out of the spot you were holding and try another path. I found out Monday night that the provost at the school where we live couldn't find the budget to create a position for me like he'd hoped. I was a bit disappointed, but since I'd done everything I possibly could to try to make it happen (e.g., drew up a draft description for the position, set up a follow-up meeting with the provost), it felt more like taking my finger out of that place in the book -- OK, I've followed that path to its end, time to try something new. 4. Options aren't always what they seem. Since reaching "The End" often meant you'd died somehow, I'd try to pick whichever option seemed safest. But really, you never knew. Going in the basement of the scary house in the woods after midnight might mean finding a mound of treasure, while turning around and going home might mean getting chased and eaten by a bear. The uncertainty of the future is a bit frightening, but it can also be comforting, and it's a way to combat all the people who think they know what I "should" be doing with my life right now. I took a full-time position that sounded like my dream job and turned out to be a disaster, so who knows? Maybe some unconventional path will ultimately lead to great happiness and wealth for me. Better to follow what I enjoy than what I think I'm supposed to be doing. 5. There are almost always more options. After reading an entire branch of a story, there was always that moment when I'd get to flip back to one of the early decisions I'd made and know that a whole new array of possible stories still awaited. And then, after I'd read everything, I'd flip through the book and invariably find a page or even an entire story branch I'd somehow accidentally skipped. And then, after that, there were more books to explore. The provost can't hire me full time, but he wants me to do some consulting work for the university, which is a chance for me to show my skills and earn some money. Then there's the other campus office that wants to interview me next month. If that doesn't pan out, I'm going to focus my energy on my job search couching business for a while. Then it'll be back to networking and applying to online postings. Before, I was looking at all the options before me as a series of doors from which I had to try to pick the right one, go through, and never return. Now, I'm seeing my life more as a Choose Your Own Adventure -- pick a door, follow the path to its logical end, and if it doesn't pan out, double back and try the next one. Thankfully, none of my paths are likely to lead to getting eaten by a bear. Great metaphor! I also read those books in a way similar to you and would also go back at a particular crossroads and see what would happen if I read that way. Did you ever read the "Earth Inspector" series? Same publisher, I think, but despite all the different choices, you always had the same ending - I always preferred this series because I knew where I was headed (clearly I hated uncertainty in my choices even as a kid!). I've never heard of the Earth Inspector series. I don't know whether I would like it better knowing that the ending was going to be the same no matter which choices I made. I think one of the things I liked about the Choose Your Own Adventure series was knowing that there were some "right" paths (i.e., where you didn't die), and trying to find my way there, like solving a maze. 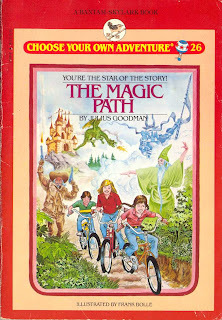 I hated Choose Your Own Adventure books as a kid! I hated the uncertainty and what felt like a very high risk of "dying" no matter what choice you made. This may explain a few things about me, like why I spent a lot of time in college crying and hand-wringing about my future, terrified of making "the wrong decision"... I think the way you've applied it here is a great and healthy way to look at decision making, though! Even the end of a particular path is not the end of your journey. I think there are a lot of cultural messages that make life decisions seem fraught with potential "wrong" steps -- the idea of soulmate (you must find the one person you're meant to be with), a dream job (a non-existent job that is perfect in every way), a calling (what you're really supposed to do with your life), etc. It's taken me a while to start to break away from that kind of way of thinking. Nice post! These are indeed important lessons. I sometimes have a lot of trouble with #1; maybe it will help to think of making the choice as setting out on an adventure! I had not heard of Meanwhile, but the app looks like it would be really interesting. Thanks for sharing! Haha, glad to know I'm not the only one who read the books in this meticulous way. Definitely e-mail me! I'd love to chat.